Multi-layered Tamper Evident Packaging Tape Coated with high-grade Pressure Sensitive Adhesive. Special printing and laminating technology creates tamper evident performance when peeled off. Tamper Evident Packaging Tape - ‘VOID/OPENED’ message remains clearly visible on the tape and on the package surface after first attempt to peel off - providing a clear indication of tampering. Package remains closed after tampering by peeling. Cannot be resealed after first opening. 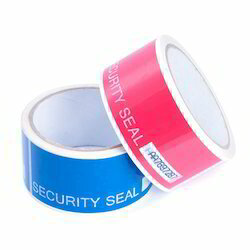 Looking for Security Tapes ?